Rev. Joseph E. Meara, CSV, brother of the Rev. James F. Meara, CSV, died Oct. 22, 1962 in Santa Cruz, CA, following a six week illness. He was 53. Fr. Meara was born Aug. 30, 1909 in Decatur, IL. He attended St. Patrick Grade School and Decatur High School in his hometown. He entered the Viatorian novitiate in 1929 in Bourbonnais and pronounced his first vows on Sept. 12, 1930. Fr. Meara attended St. Viator College in Bourbonnais from 1930-1934 where he earned his Bachelor’s degree in mathematics with minors in philosophy and history. Seminary immediately followed at the Catholic University of America in Washington, DC, where in addition to his required courses in theology, Meara earned his Master’s degree in geology with a minor in mathematics in 1938. Fr. Meara pronounced his final vows on Aug. 26, 1936. Ordination to the priesthood was held on Jun. 12, 1938 in the National Shrine of the Immaculate Conception. During all his priestly life, Fr. Meara combined the work of teacher of Christian Doctrine with the Service of the Holy Altar. His teaching subjects were religion, mathematics, geology and general science. 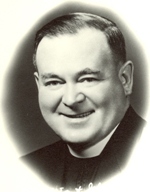 His first assignment after ordination was as a teacher at Cathedral Boys High School in Springfield, IL combined with weekend and summer assistance at various local parishes from 1938-1940. He returned again from 1942-1948 and 1950 for a total of nine years of teaching there. From 1940-1942, Fr. Meara was assigned to St. Philip High School in Chicago and again for three semesters in 1949, 1950 and 1951. The year 1948-49, he spent teaching at Archbishop Stepanic High School in White Plains, NY. Fr. Meara’s last high school teaching assignment was from 1951-1959 at St. Patrick High School in Kankakee, where he also worked as an assistant at St. Patrick Church. Soon after arriving in Kankakee, Fr. Meara was appointed by the Bishop of Joliet as the director of the Catholic Youth Organization in the area. He also took on the role of spiritual director for St. Viateur’s Council, Knights of Columbus. Fr. Meara spent the summer of 1959, as chaplain for the Providence nuns at St. Mary-of-the-Woods in Indiana. The following fall, he again was given a combined assignment of teacher and chaplain at Presentation College and Convent in Aberdeen, SD. In 1961, Fr. Meara was assigned as assistant pastor at St. Joseph Parish in Capitola, CA, a large neglected parish in the Diocese of Monterey-Fresno. His health had been deteriorating in recent years, but the climate of Capitola uplifted him. His requiem Mass took place Oct. 25 at St. Joseph Church and parishioners packed the church drawn by their love and affection for him. The same outpouring of respect was shown at his wake and funeral on Oct. 26 at St. Patrick Church in Kankakee. His brother, the Rev. James F. Meara, CSV, celebrated the Mass and the sermon was preached by the Rev. John P. Lynch, CSV. Burial took place in the Viatorian Community plot at Queen of Heaven Cemetery in Hillside, IL with prayers at the grave by the provincial, the Rev. John W. Stafford, CSV.